IMAGINE – A FEW DROPS OF WATER TURNED INTO STEAM CAN HELP ALLEVIATE THE SYMPTOMS OF BPH. Rezūm is a safe and effective office-based treatment that uses thermal energy in water vapor to reduce and remove obstructive tissue surrounding the prostate. The minimally invasive Rezūm procedure provides men with another treatment alternative that minimizes certain unwanted side effects sometimes experienced with medications or other more invasive procedures including erectile dysfunction and urinary incontinence. The FDA approved the Rezūm System as a treatment for BPH in 2015. Using sterile water vapor (steam), targeted and controlled doses of stored thermal energy is delivered directly to the region of the prostate gland with the obstructive tissue that causes BPH. A thin device, similar in shape and size to a cystoscope, is inserted into the urethra by the urologist. <0.5mL of sterile water is then heated within this device’s inductive coil to create stored thermal energy in the form of water vapor. 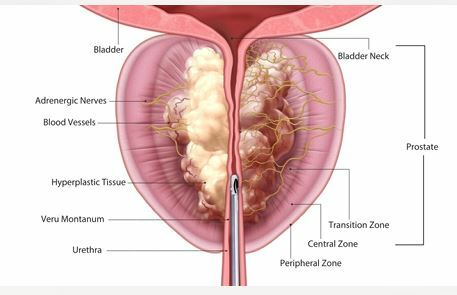 A thin needle is then deployed through the device in the urethra into the prostate tissue where water vapor is delivered directly into the enlarged tissue that is causing the obstruction and dispersed through the spaces in the tissue. Upon contact with the tissue, the vapor condenses into its liquid state, releasing the stored thermal energy contained within the vapor. This thermal energy is released directly against the walls of the tissue cells within the treatment zone, causing almost instantaneous cell death. Rezūm water vapor therapy has been proven to provide patients with significant improvement in BPH symptoms, including frequency, urgency, weak stream, straining to urinate and nocturia (frequent nighttime urination) while preserving erectile function and urinary continence. The Rezūm treatment is minimally invasive. The procedure takes less than a half hour and can be done awake with local anesthesia or under light sedation. Rezūm is performed in your urologist’s office or in one of Colorado Urology’s Summit Ambulatory Surgery Centers (ASC). 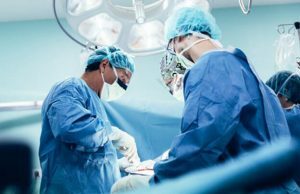 The treatment does not require patients to undergo general anesthesia like laser surgery or transurethral resection. Rezūm is covered by most insurance plans.